Linda Rose Herman, in her role of "Grief Counselor", wears a name tag with her real name "Linda Herman" on it. Miscellaneous: The credits thank, among other entities, "Oahu County" and "Kauai County". There is no "Oahu County" - Oahu is the island, but it is Honolulu County. Kauai County does exist. Matt King: [voice-over] Don't be fooled by appearances. In Hawaii, some of the most powerful people look like bums and stuntmen. 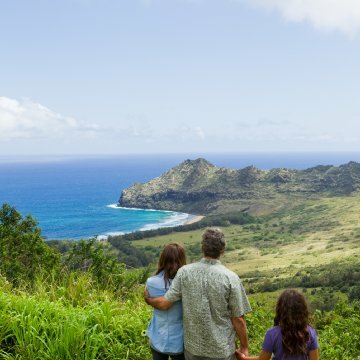 The Descendants is not a movie that's easily defined. In the macro view, it's about a man grieving for his wife, who lies in a coma from which she may never emerge, while simultaneously attempting to care for his two rambunctious daughters, each of whom is nearly alien to the workaholic man. But don't hastily dismiss this as a tearjerker about some guy coming to grips with mortality and/or learning a little something about himself along the way. This is a movie that runs the gamut of emotions, with pristine sincerity, grace, dignity, and rich realism. Matt King (George Clooney) is the workaholic, a lawyer who lives in Hawaii. He has a good life - at least until his thrill-seeking wife suffers a serious head injury during a powerboat race, placing her in a deep coma. Matt's orderly life is no more. He must not only deal with the fact that he may never speak with his wife again, he must also learn an entirely new way of life - one with a domestic tinge. As wife Elizabeth's condition deteriorates, Matt must also deal with family and friends and open doors he never knew existed. All right, that's sort of cryptic, so let me give you this tidbit that is in no way a secret in the plot - Elizabeth, Matt shortly discovers, was having an affair at the time of her accident. On top of all of that stress and drama, Matt is the sole trustee of a huge plot of land that has been a part of his family for a very, very long time. He and his cousins have decided to field offers for the land, because the trust becomes dissolved in seven short years. Should they sell to the highest bidder or to a local businessman? Either outcome would leave all of them very rich indeed. The sale of the land will make a huge impact on the island, as it could transform what many see as a beautiful, nearly untouched mark of beauty into a symbol of avarice and decadence. The core of the entire story is Clooney's unbelievably terrific performance; he is vulnerable, strong, confused, decisive, anguished, angry. It's not every actor who can pull off such a wide range of expression, and Clooney is so effective in this movie that you sincerely feel as if you are standing directly in his shoes, seeing all from his perspective rather than just through his eyes. To say that Clooney's Matt is troubled is an understatement, but what makes this performance so remarkable to me is that at no time does he have all of the answers, and at no time does he have no answers at all. He is, to put it another way, us. The tremendous amount of pressure under which Matt finds himself is exacerbated by his daughters' behavior; partly their reaction to their mother's plight but also because, well, they're precocious and self- absorbed, as most kids are when they're teens or preteens. Add in Matt's cluelessness about how to take care of girls; then you have a real recipe for a wacky sitcom, don't you? Only here it's as real as it gets. First there's 10 year old Scotti (newcomer Amara Miller), who acts out in class - including bringing in pictures of her comatose mother for show and tell. Scotti seems like a girl who just hasn't had enough of a male influence in her short life; you get the impression that Mom was the one who took care of the kids while Dad worked and worked. As a result, Scotti is combining typical rebellious behavior with confusion on how she should feel about her mother's being in a coma. Then there's Alexandra, currently away at boarding school; for her, you get the clear impression that she's a real problem child who's used to being shunted from school to school, like a queen of diamonds in a marked-up deck. She's away when the accident occurs; Matt retrieves her (discovering she's as wild as always) and necessarily leans on her to help him deal with his various problems. Rest assured, there are moments that will jerk tears from you. 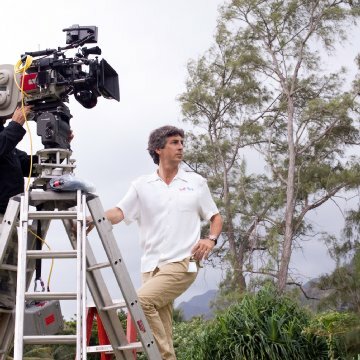 However, director Alexander Payne does an amazing job of keeping everything level. This isn't a four-hankie movie, because life isn't a four-hankie movie. Life has its terrible moments and its joyous ones, too, and this film emulates that layer of authenticity to really deliver an emotionally powerful, provocative, and endearing story. This isn't a movie you can just grab the kids and some popcorn and be lightly entertained, but it's also not a Think Hard movie. It's somewhere in the middle - again, much like life. Payne and cowriters Nat Faxon and Jim Rash allow us to become psychologically engaged with everything concerning Matt and his family. We're with him so much that when he makes a blunder, we think to ourselves that we'd probably make the same blunder. It's a pleasure to see a movie in which the protagonist clearly doesn't have all of the answers, even to the easy questions, but has some answers to the hard ones. And that's why this is a hard movie to pigeonhole, and it's also why it's such a beautiful, artful film.